Scarcely a day goes by now where we do not read of yet another in a constellation of initiatives being undertaken by both the Russian Orthodox Church and the Russian government on behalf of persecuted Christians and other victims in Syria, Egypt, and elsewhere in the world. For instance, on July 31 it was announced that a charitable drive launched at the end of June by Patriarch Kirill of Moscow and All Russia had raised US$1.3 Million to assist victims of the Syrian armed conflict. That these funds will be distributed through the auspices of both Orthodox Christian Patriarch John X of Antioch as well as Supreme Mufti Ahmad Badreddin Hassoun of Syria, shows the Moscow Patriarchate’s application of the Christian principle of caring for one’s neighbor, regardless of creed. Patriarch Kyrill of Moscow and All Russia at the recent celebration of the 1025th Anniversary of the Baptism of Rus. “Representatives of the Russian Orthodox Church have carried medical equipment at the amount of about three million rubles to Damascus,” said Hieromonk Efrem, acting representative of the Patriarch of Moscow and All Russia for the Patriarch of Antioch. Yet the Russian Church is not limiting her involvement with world affairs to “mere” acts of grassroots charity. 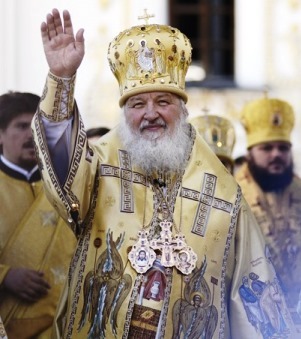 In July, Patriarch Kirill of Moscow, together with Russian President Vladimir Putin, took the occasion of the recent celebrations in Moscow, Kiev and Belarus of the 1025th anniversary of the Baptism of Rus into Orthodox Christianity as the ideal opportunity to nurture the conciliar ties among the Local Orthodox Churches, who together comprise the world’s second largest Christian communion, with an estimated 225-300 million members. I would like to speak about the situation of Christian minority in the Middle East and in some other countries… Christians are killed, Christian women are raped, Christian Churches are burned down, mass exodus of Christians from the lands, where they used to live in peace with Muslims and representatives of other religions, is taking place. Metropolitan Hilarion expressed his wish that… systematic protection of Christians subjected to persecution in different countries will be one of the trends in Russian foreign policy. For Putin, this will be his second trip to Cairo; his first took place in 2005 when Hosni Mubarak was president. He will play it to the hilt as a platform to show the world, and especially Arab Muslims, that he alone of the world’s five leading powers is openly committed to fighting radical Islam and ready to assist any Arab leader sharing this commitment. This tough realpolitik approach is the only way to confront Islamic supremacists, and at the same time protect the world’s persecuted Christian communities. Indeed, Putin’s vigorous approach to foreign policy is like clear, fresh water, after being exposed for so long to the muck of the Obama administration’s incomprehensible support of toxic Islamic extremists and terrorists in Tunisia, Libya, Egypt, Syria and elsewhere. The United States, unmoored from her Christian and moral foundations, and with her leadership enabling Islamic extremists and terrorists, herself founders in the raging waves of history, and has already abandoned the world’s Christians to perish in the tempest. Whereas it is Russia, led by her revitalized Christian conscience — personified in the resurgent Russian Orthodox Church— which presents an image of assured strength, moral clarity, and unflinching resolve in the face of evil. Russia has founded her house on a rock, and, having been already tested by decades of persecution, knows how to endure the storms of history.